Earlier today, a powerful typhoon ravaged Okinawa, Japan. This is serious stuff. People were urged to seek shelter as islands were hit with strong winds and rain. The way that this building was wrecked might surprise you. Above, you can see a restaurant called "Sakae" (栄), which means "glory" in Japanese. 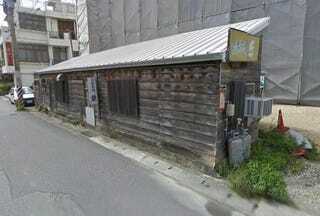 Located in the city of Naha, it is a small restaurant with about four tables or so inside and an inexpensive menu. Rather, it was. The building wasn't flattened, but as you can see in the photo courtesy Twitter user KURO_yasu45, it's been unfolded. To better understand what you are looking at, here is an image from the biggest Japanese internet forum, 2ch, which labels each part of the wreckage. Online in Japan, people have been comparing the destruction to a dollhouse that unfolds. Hopefully the owner of this restaurant has insurance and can get this establishment rebuilt. Glad that apparently no one was hurt.